William Garner Sutherland DO (1873-1954) graduated from the American School of Osteopathy (ASO) in 1900. As a student of Dr. Andrew Still, he took the admonition to “keep digging” very seriously. As a senior student at ASO, Dr. Sutherland happened upon a disarticulated skull in the North Hall, noting the beveled artiulcatons of the spheno-squamous suture. He had an inspiration that the bony cranium was capable of respiratory motion. This “guiding thought” was initially quite confusing, but Dr. Sutherland could not let the idea go. Throughout his years of practice, with diligent research and study, he gradually developed a revolutionary expansion of the osteopathic concept. Dr. Sutherland’s first public announcement of his new cranial ideas were presented in September 1929, before a district meeting of the Minnesota Osteopathic Association, in a paper titled “Bedside Technique” by Blunt Bones Bill. 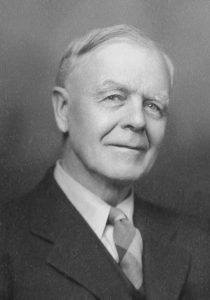 Dr. Sutherland called his discovery “Osteopathy In The Cranial Field” (OCF), implying that he did not create anything new. He had simply applied osteopathic thinking and principles to the cranium. 1. Primary: it is a system that comes “first.” It underlies all of life’s processes and gives dynamism, form, and substance to all of anatomy and physiology. The Primary Respiratory Mechanism has classically been described as consisting of fIve components. These phenomena are expressions of involuntary physicologic motion within the central nervous system and it’s adjacent anatomy. The brain and spinal cord undulate rhythmically like a jelly fish. As the brain coils and uncoils, the cavities within the brain (ventricles) and around the brain (cisterns) change shape. During the inhalation phase (flexion) the brain (and bony cranium) gets shorter and wider. During the exhalation phase (extension) the brain (and bony cranium) gets taller and narrower. The Meninges are the membranes that surround the brain and spinal chord, and contain the cerebro-spinal fluid. The Dura Mater is the toughest and most outer layer of the meninges. The Dura Mater also has an internal architecture comprised of 3 sickles.One runs back to front (called the falx cerebri) and separates the two cerebral hemispheres. 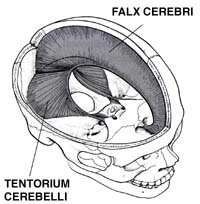 There are two other sickles, one on each side of the falx (called the tentorium cerebelli) that also run from the back to the front, somewhat parallel to the floor (when you are standing straight). The tentorium cerebelli gets its name from being “tent” shaped. The dura covering the outside of the brain then attaches firmly to the foramen magnum and upper cervical vertebrae, surrounds the spinal cord and descends to attach to the sacrum at the 2nd sacral segment. These dural membranes are under constant tension. They are taut. Because of the tension through them, we refer to the Dura Mater as a Reciprocal Tension Membrane (RTM). If you pull on one end of the membrane, that pull is transmitted throughout. The Dura maintains the structural integrity of the bony cranium (as it attaches into the bones). Movement of the brain, and CSF becomes translated into the membranes as a dynamic shifting of the reciprocal tension. So when the head is traumatized, the dural membranes may become twisted and compressed. The fulcrum around which the rhythmic movement is organized… becomes deranged. Often these membranes are the primary seat of the cranial dysfunction, actively distorting the bones they support. This movement of the cranial bones is considered controversial. Conventional thinking considers the skull to be fused. The concept of a fused skull is erroneous, dating back to a paper written in 1873, known as “The Monro-Kellie Doctrine.” The research supporting this doctrine is over 100 years old and was not very precise. More recent research supports our clinical observations of cranial bone mobility. Gradually, the mobility of the cranial bones is becoming a more widely accepted concept. It has been found in some anatomic specimens that certain cranial sutures have fused. When fusion occurs, however, it is a pathological condition. Sutural fusion occurs because the cranium has received an impact causing the bones to compress, and lose their sutural mobility. When any joint in the body becomes immobile, it will fuse. (Put your arm in a sling, and after some time you’ll lose motion in your shoulder). In health, the Cranial Sutures are patent and allow for a slight amount of motion. Another wrinkle… We consider the bones themselves to actually be a very dense fluid. They are living tissue. They are constantly being reabsorbed and recreated. They have inherent flexibilty. Traumatic influences not only compress bones together, but cause them to “stiffen” and lose their fluid nature. The sacrum is connected to the cranium via the dural membranes that surround the spinal chord. The dura between the occiput and sacrum is referred to as “the core link.” Attached only at the base of the skull and the sacrum at the 2nd sacral segment, the motion of the occiput is transmitted freely to the sacrum. The relationship of the sacrum with the occiput becomes clinically relevant when the cause of headaches may be due to a fall on the tailbone many years previously. Dr. Sutherland was the first to discover and reason the activity of these well known anatomic structures. This model of physiologic activity provides an introduction to the “therapeutic process,” and an introduction to the experience of Primary Respiration.